CartONG is changing the format of its newsletter, and will be using MailChimp from now on! You are receiving this newsletter in English, if you would like to receive it in French in the future, please let us know here. Have a nice reading! Also, the 2018 GeOnG Forum is coming up, don't forget to register online! CartONG is providing constant support to its partners operating in the field to make better, more informed decision-making thanks to geospatial information. In particular, in the race against time that characterize infectious diseases crises, the use of spatial visualization to comprehend the dynamics of an outbreak has proven to be a powerful tool. In the context of the dramatic cholera crisis happening in Yemen in 2017, CartONG proceeded to develop the EpiMap for its partner, the GIS Unit of MSF (Doctors Without Borders Switzerland). Discover more here about this ﬂexible, portable mapping tool able to adapt to a variety of diﬀerent contexts. CartONG and its partner Les petits débrouillards are implementing a new project from August 2018 to May 2019 cross the Auvergne-Rhône-Alpes (AuRA) region. 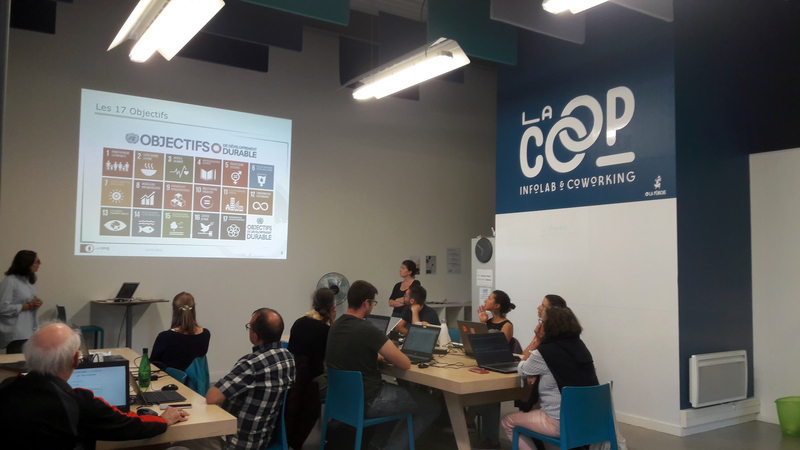 This new initiative aims to raise general public awareness about the Sustainable Development Goals (SDGs) and is supported by the European Commission and RESACOOP. « EducAuRA, objective 2030 » contributes to disseminating information about the SDGs so that citizens of AuRA can better understand the concept and support them. This new project will be implemented through a large range of activities for young children, teenagers and adults, including the opportunity to interview humanitarian staff to learn more about SDGs, as well as conference-debates, activities during festivals, cartographic exhibitions and mapathons for a larger audience. Two children activities about sustainable food and renewable energy and one mapathon about climate change have already been organized. Three activities open to the public will also be organized as part of the GeOnG 2018! 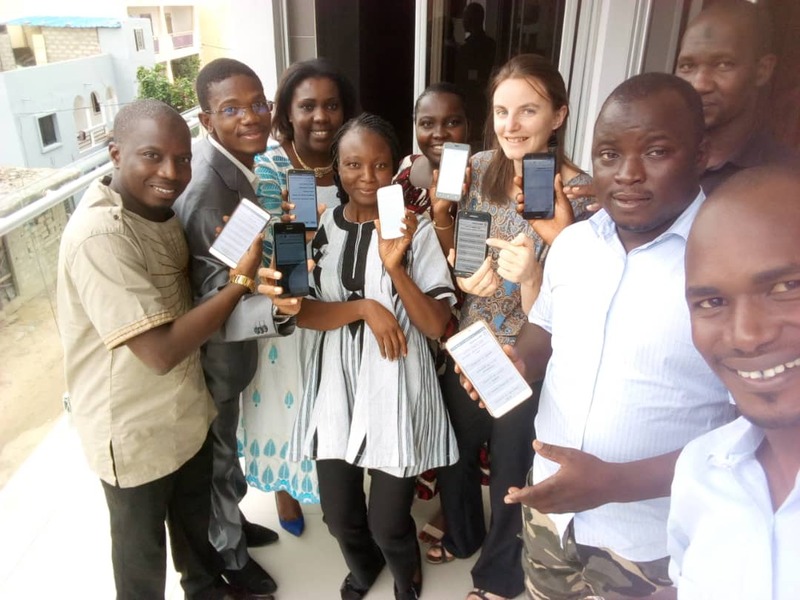 CartONG recently organized its first 5-day Mobile Data Collection training at the Bioforce Institute in Dakar (Senegal). 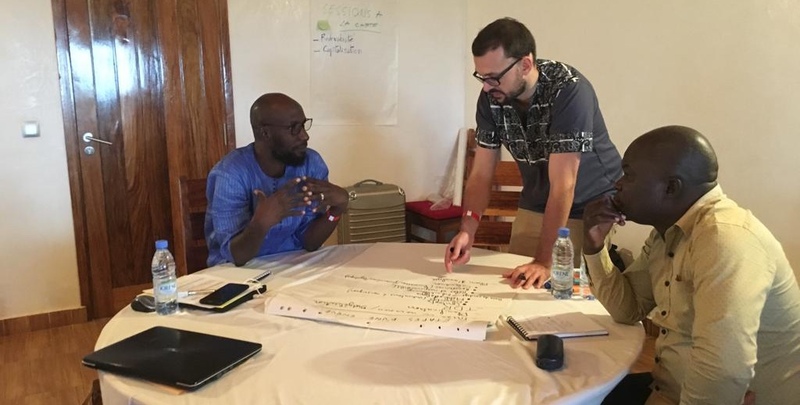 At this occasion, staff from 6 countries - Niger, Central African Republic, Mali, Burkina-Faso, Cameroon & Guinea Conakry - and 5 humanitarian & development organizations were trained. CartONG will also continue to provide short training courses at the Bioforce Institute in Vénissieux for the 2018/2019 academic year. This year, we will train 6 different groups from the WASH, Logistics and Project Management programs. CartONG attended the World Forum Convergences in Paris on September 3rd and 4th, as well as La rentrée des associations in Chambéry on September 8th. This was the perfect occasion to raise awareness about the work of CartONG, and to promote the upcoming GeOnG at a local level. 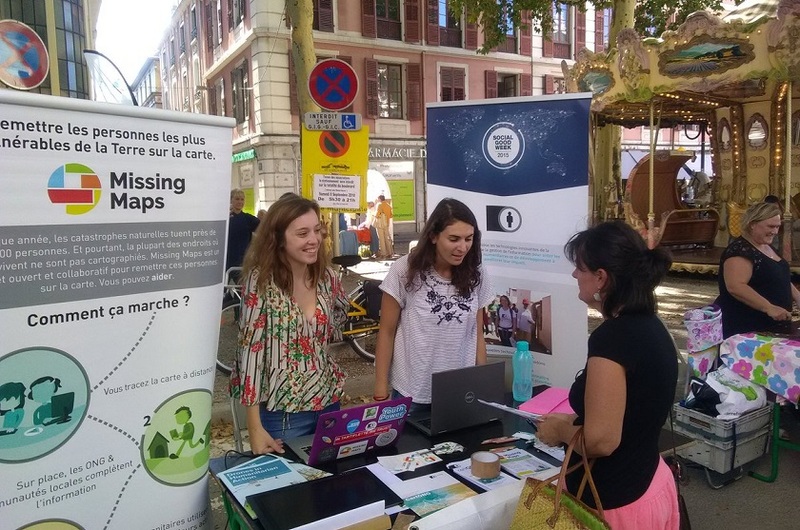 It was also an opportunity for CartONG to inform the inhabitants of Chambéry about our projects taking place in France, such as Missing Maps, Educ’Aura: Objective 2030 as well as Maps from here & abroad. Several mapathons and activities have already been planned for the fall. More information here. 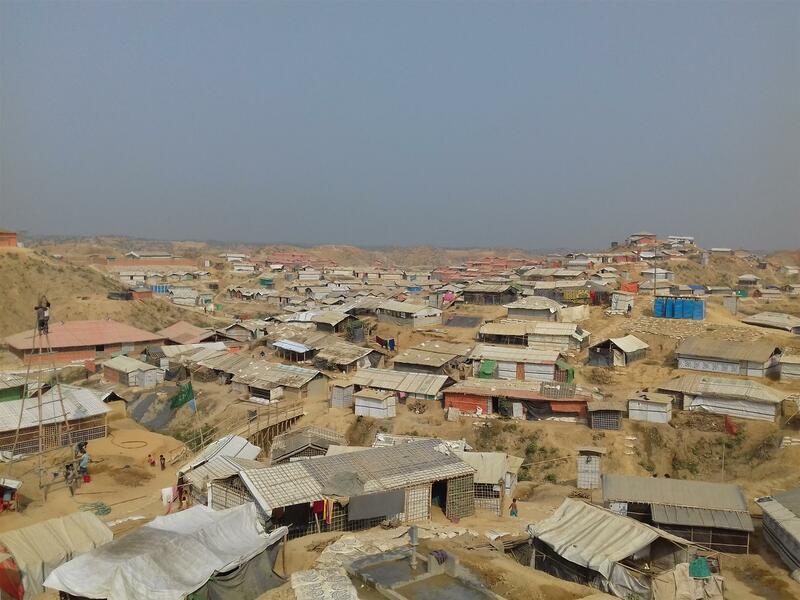 CartONG evaluated the Information Management policies, processes, practices and tools implemented by the Solidarités International team in response to the Rohingya crisis in Bangladesh as well as the Syrian crisis. These two missions included interviews of key staff, facilitation of workshops, review of documentation and Information Management products, and the drafting of a recommendation report. As part of the project “Building a Data Collaborative to support the SDG on Health in DRC”, CartONG has organized a second workshop in Kinshasa with local stakeholders to present the advances made over the past months (in particular for health areas mapping) and prepare the finalization of the project and its handover to local actors. A field mission is currently ongoing with OSM-DRC in the Tanganyika province to test the methodologies compiled during this project. CartONG conducted an GIS induction training for Action Contre la Faim in Dakar (Senegal) this September. The training course was designed for MEAL (Monitoring, Evaluation, Accountability and Learning) specialists, and included an overview of basic GIS principles. 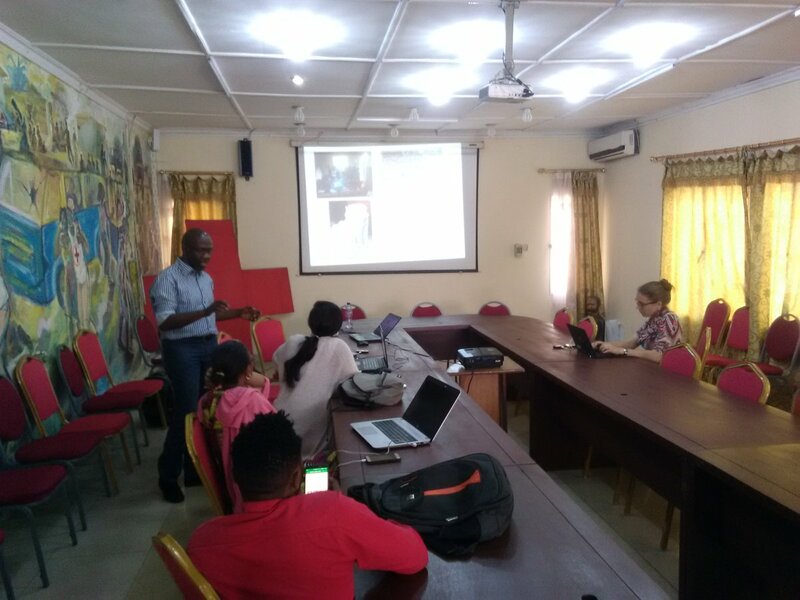 The participants learned how to use Google Earth and cartographic tools usable on their mobile phones (OsmAnd), as well as a hands-on session on Carto.com. Spreading the word about SolidaTeach! SolidaTech is a program which promotes digital access for NGOs, charitable foundations and public institutions such as libraries. It is supported by “Les Ateliers du Bocage”, a social enterprise which is a member of Emmaus France. SolidaTech provides to these structures, software, IT equipments, training sessions, services and also a resource center for an affordable price. If you’d like to benefit from the digital solutions offered by SolidaTech, you need to register online at www.solidatech.fr and provide basic information about your organization such as statutes and SIRET or RNA number. The program also regularly organizes events to help the associative sector better understand the challenges associated with the digital world. It is celebrating its 10-year anniversary in 2018: it had already benefited to more than 25 000 associations, including CartONG. The association will celebrate its anniversary on Thursday 22nd of November at the Maison des associations de solidarité in Paris. Discover other resources on the Cartoblog ! CartONG will attend the private sessions on October 11th and 12th. Come and meet us during the public event on Saturday 13th at Espace Louis Simon in Gaillard (near Annemasse and Geneva). CartONG will be present at "Je découvre la Solidarité Internationale à travers le bénévolat et le volontariat" session. The GeOnG is coming up soon! Have a look at the provisional agenda and register online here! CartONG will take part in the 2018 OSM Geography Awareness Week #osmgeoweek2018. More information to come soon on social media. You’re passionate about photography? You like the challenge of preparing good food for a large group of people? Or you’re just motivated to help CartONG on general logistics and note taking? We are looking for volunteers for the GeOnG, the Humanitarian Data Forum we organise every two years, which is to take place this year from October 29th to 31st! 3 days of captivating exchanges, made possible by the work of our staff and volunteers. Our team will also gather the weekend before for a special Get-Together, a great opportunity to discover the life of the association! Join us: more information and registration here. Please also register on the general platform used for the GeOnG. For any questions, do not hesitate to contact Charlotte & Claire. Back to school! Looking to support us? Join our members! Membership is a major tool for us to involve people in our activities, reinforce the dynamics within the association and strengthen its legitimacy. It also enables anyone who is interested to receive first-hand updates and participate in the life of our organization. So as summer ends and the academic year starts again, join the ranks of our incredible 2018 members here! For fresh updates on our volunteer activities or to suggest new ones, also feel free to join us for our first volunteer meeting of this academic year, on Tuesday October 2nd, at the Maison du Libre et des Communs (Paris) and on Skype. More details here.